This retreat is a collaboration of Tami Macala and Vickie Emanuele. Tami is a mosaic artist with over 20 years of experience, and Vickie is a world-renowned energy healer, medium and psychic. Vickie and Tami have personally designed this retreat to create a space for exploring and healing your heart, manifesting abundance and allowing yourself to play and just be. This retreat will bring together the talents of both Tami and Vickie as they each lead participants to explore in a safe and creative space how to manifest more abundance in their lives. If you’re looking to create more prosperity, love and happiness in your life, this retreat is for you. 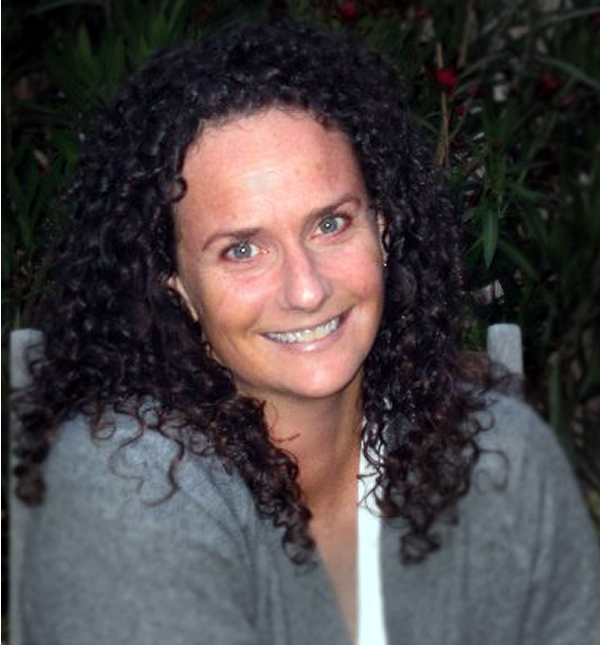 Vickie will lead participants through healing circles, meditations, cord cutting, manifesting techniques, journal writing, hiking, beach walks and much more. Tami will lead participants in the creation of a Mantra Board. This style of mosaic art is a mixed media approach designed for any level. Participants will choose their own affirmation words and add sentimental objects as well as other materials to create their own mosaic art project. Tami will cover basic techniques and skills as participants create their work in a relaxing environment with warm ocean breezes and waves crashing below. Todos Santos is an artist colony on the Tropic of Cancer, just one hour north of Cabo San Lucas, but an entire world away. Nestled next to 70 miles of pristine, undeveloped beach, Todos Santos is famous for the remarkable quality of light, which drew the first American artists from Taos in the 1980’s. 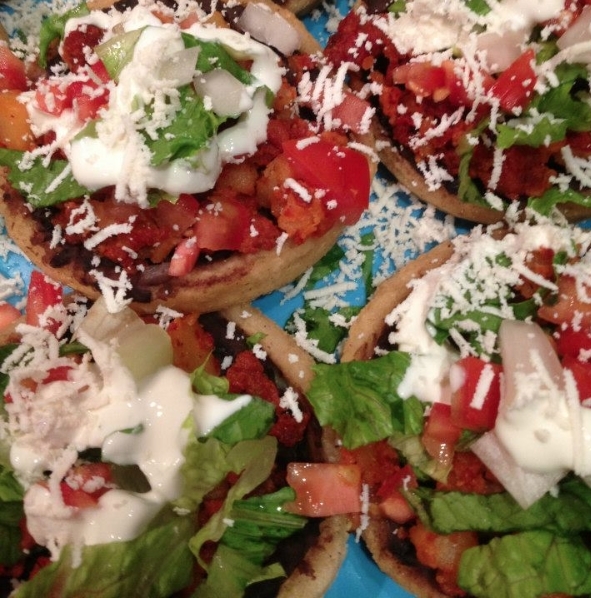 Todos Santos is full of wonderful restaurants, art galleries and quaint shops. Accommodations for this retreat will be at the beautiful boutique hotel, Los Colibris Casitas. Los Colibris has a variety of wonderfully inviting casitas, each with comfortable beds, spacious and nicely decorated bathrooms and private patios from which you can enjoy the amazing scenery as the waves crash below. The infinity pool and hot tub are great for star-gazing and relaxing day and night. Read more here. There will be free time to explore the town of Todos Santos and its surrounding areas. Popular activities include gallery strolls, shopping and eating in town. There will also be excursion options that can be booked through Todos Santos Eco Adventures (before or after the retreat if you choose to extend your stay). Massage is offered at Los Colibris in your room by appointment. You can learn more here, or contact Tami here. I’m a professional mosaic artist and teacher. I’ve been creating art all my life, and mosaic art for almost 20 years. In 2009 I started the Santa Barbara School of Mosaic Art based on my love for mosaic art and desire to share my passion with other creative people. 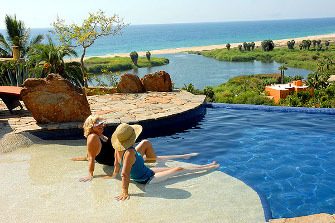 I’ve vacationed in Todos Santos several times in the past four years and have stayed at Los Colibris each trip. I love the rustic and quaint feeling of Todos Santos, and Los Colibris is the perfect location for the accommodations and creating a wonderful environment for this mosaic retreat. Vickie Emanuele is an internationally renowned energy healer, intuitive, and medium for people and pets. She has worked as a spiritual teacher, healer and manifesting coach for over 15 years. She’s also the host of the weekly radio show, Energy Goddess, author of the book Manifest ANYTHING You Want in 30 Days, and the CEO of Magical U, an online energy academy, helping people find the magic within to heal and manifest. She’s been featured on TV, newspapers, and several radio shows. Thank You for Reading, and Please Share! Imagine creating art with spectacular ocean views to inspire you, beautiful gardens and pools to relax you, and a personal chef to prepare gourmet meals to sustain you. This is just the beginning of the Todos Santos mosaic art retreat. You’ll spend one full week creating mosaic art in one of the most creative and peaceful settings on the Baja Peninsula, the pueblo magico of Todos Santos. Accommodations for this retreat will be at the beautiful boutique hotel, Los Colibris Casitas. Los Colibris has 8 wonderfully inviting casitas, each with comfortable beds, great bathrooms and private patios from which you can enjoy the amazing scenery and ocean views. The infinity pool and hot tub are great for star gazing and observing the humpback and grey whales that are often visitors at certain times of year. These workshops are created with the beginner in mind. We just ask that you come with a creative spirit and fun positive energy! At this retreat students will learn how to create a mosaic with Mexican smalti, the vibrant and wonderful glass tiles from Cuernavaca Mexico. Participants will learn how to create a design or abstract. We’ll then move on to deciding color choices, how to lay out the design, proper cutting techniques and proper adhesion. Todos Santos is an artist colony on the Tropic of Cancer, just one hour north of Cabo San Lucas, but an entire world away. Nestled next to 70 miles of pristine, undeveloped beach, Todos Santos is famous for the remarkable quality of its light, which drew the first American artists from Taos in the 1980s. Since then, artists of all stripes and nationalities have populated the town, which is a charming reflection of their passions with wonderful restaurants, art galleries, and shops. The people of Todos Santos are warm and welcoming, and love sharing the pleasures of their hometown with visitors. The beaches of nearby Pescadero and Cerritos are added bonuses. Retreat Price: $1,699.00 (based on double occupancy). Instruction: 5 days from 10:00 AM – 2:00 PM. More work time will be available if desired. You’ll have plenty of free time to explore Todos Santos and its surrounding areas. Popular activities include hiking, beach walks, whale watching, gallery strolls, and shopping. There will also be excursion options that can be booked through Todos Santos Eco Adventures if you choose to extend your stay. Massage and yoga are offered at Los Colibris (Los Colibris’ yoga deck sits at the highest point of the property on the tropic of cancer, and has one of the most amazing views of the Pacific). Room selections will be made in order of full payments received. Here are a few websites to check out: Los Colibris Hotel, Todos Santos Eco Adventures, Todos Santos Eco Adventures Facebook, and Santa Barbara School of Mosaic Art. For More Information or to Register: Read more here. Email Tami here or call 805.703.4291. Imagine creating mosaic art with spectacular ocean views to inspire you, beautiful gardens and pools to relax you, and a personal chef to prepare gourmet meals to sustain you. This is just the beginning of the Todos Santos mosaic art retreat. You will spend one full week creating mosaic art in one of the most creative and peaceful settings on the Baja Peninsula, the pueblo magico of Todos Santos. The accommodations for this retreat will be at the beautiful boutique hotel, Los Colibris Casitas. Los Colibris has 6 wonderfully inviting casitas, each with comfortable beds, great clean bathrooms, and private patios to enjoy the amazing scenery and ocean views. The infinity pool and hot tub are great for star gazing and observing the humpback and grey whales that often visit at this time of year. During this mosaic art retreat each participant will learn the proper techniques for creating a mosaic art mural for vertical surfaces. These techniques will be achievable and repeatable for anyone that would like to create a backsplash, a shower mosaic or any other vertical mosaic on their own. During this retreat participants will work on mosaic designs that will be installed at the property of the retreat. Predetermined designs will be selected before leaving for Todos Santos, and each participant will have an opportunity to work on different parts of each of the designs. The group will go through the whole process, including grouting, so that everyone leaves with a complete hands-on experience to repeat on their own if they choose. 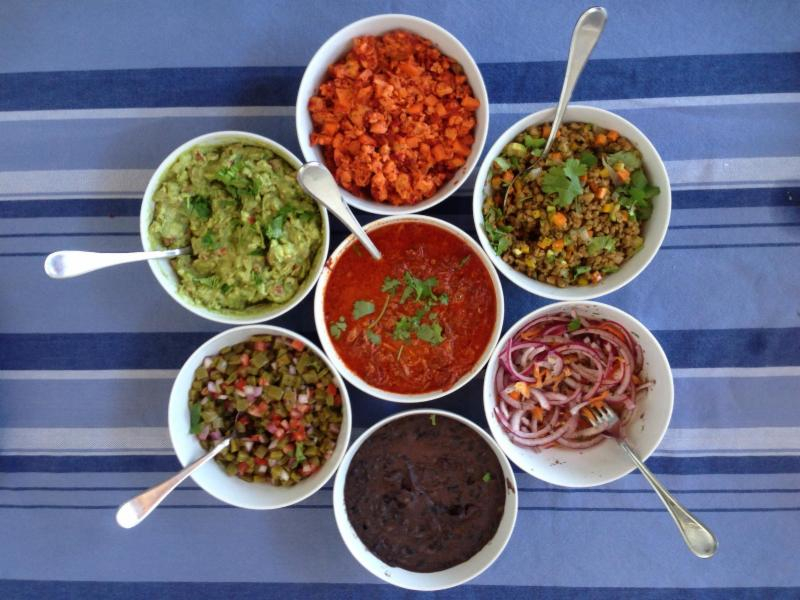 We’ll also enjoy some of the most delicious and healthy Mexican food ever — always created with love by Chef Iker. Todos Santos is an artist colony on the Tropic of Cancer, just one hour north of Cabo San Lucas, but an entire world away. Nestled next to 70 miles of pristine, undeveloped beach, Todos Santos is famous for the remarkable quality of its light, which drew the first American artists from Taos in the 1980s. Since then artists of all stripes and nationalities have populated the town, which is a charming reflection of their passions with wonderful restaurants, art galleries, and shops. The people of Todos Santos are warm and welcoming, and love sharing the pleasures of their hometown with visitors. The beaches of nearby Pescadero and Cerritos are added bonuses. Instruction: 5 days from 10a-2p. More work time will be available if desired. You will have plenty of free time to explore Todos Santos and its surrounding areas. Popular activities include a mosaic tour and gallery walk, hiking, beach walks, whale watching and shopping. There will also be excursion options that can be booked through Todos Santos Eco Adventures. Massage and yoga are offered at Los Colibris; the yoga deck sits at the highest point of the property on the tropic of cancer, and has one of the most amazing views of the Pacific. Learn more about Los Los Colibris here. Room selections will be made in order of full payments received. Deposit of $850 (1/2) may be made through PayPal (2.5% more will be added to the total using Paypal) or check. Materials, tool list & instructions on packing will be sent after registration. Payment in full must be completed by November 5, 2015. Cancellation and refund policy: All cancellations are subject to a 20% handling fee. For reservations canceled less than 90 days before the workshop, 50% is refundable. If canceled less than 60 days before the workshop, 25% is refundable. If canceled less than 45 days before the workshop, fee is non-refundable. Should the retreat be canceled for any reason the entire amount paid will be refunded within fourteen days after the retreat’s cancellation. Instructors have no obligation regarding any additional costs or fees related to the issuance and/or cancellation of airline tickets or other travel reservations. Instructors and Los Colibris accept no liability for any airline cancellation penalty incurred by the purchase of a non-refundable ticket or for canceled flights. Travel Insurance is recommended. All workshop participants should consider purchasing Trip Cancellation, Emergency Medical Evacuation, Baggage, Accident and Medical insurance from a reputable insurance company. Travel Insurance Guide is here. To register, please email Tami with name and contact info. I am a professional mosaic artist and teacher. I have been creating art all my life, and mosaic art for almost 20 years. In 2009 I started the Santa Barbara School of Mosaic Art based on my love for mosaic art and wanting share my passion with other creative people. I have vacationed in Todos Santos several times in the past three years and have stayed at Los Colibris each trip. I love the rustic and quaint feeling of Todos Santos, and Los Colibris is the perfect location for the accommodations and creating a wonderful environment for this mosaic retreat. For more information, email Tami here. If you missed this fabulously spirited retreat last winter, please join us December 7 – 13, 2014. Join Tami Macala in Todos Santos, Mexico for a lot of sea, a lot of sand, and a riot of color. You’ll spend one full week creating mosaic art in one of the most creative and peaceful settings on the Baja Peninsula, the pueblo magico of Todos Santos. The accommodations for this retreat will be at the beautiful boutique hotel, Los Colibris Casitas. Los Colibris has 4 wonderfully inviting casitas, each with comfortable beds, great bathrooms and private patios from which you can enjoy the amazing scenery and ocean views. The infinity pool and hot tub are great for star gazing and observing the humpback and grey whales that are often visitors at this time of year. 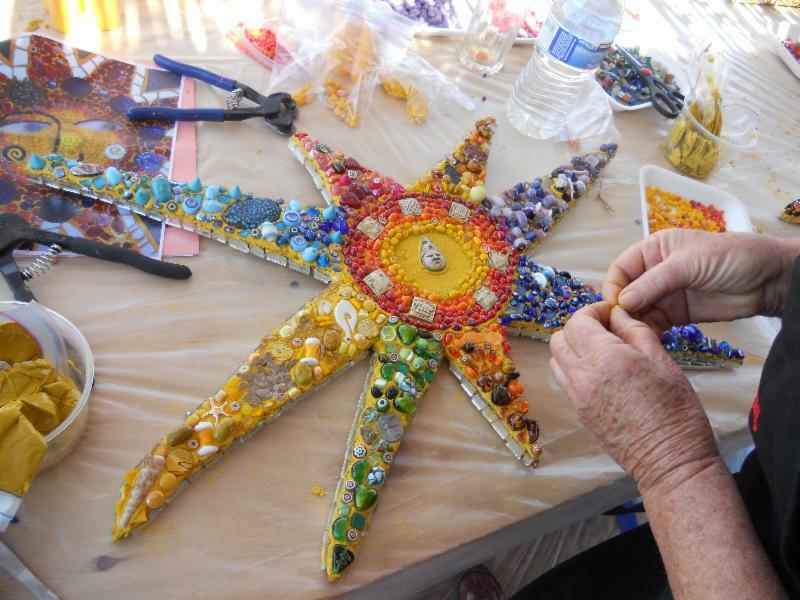 During this mosaic art retreat each participant will work on a flat 3D shape, using your own found objects, sentimental pieces, millefiori, mirror and stained glass. We’ll learn how to work with tinted mortar/thinset and grout. Participants will also learn how to embed the colorful pieces into the mortar to create a color gradation while not using grout. Grout will be used on the edges of the piece, and we’ll learn to tint that as well. Once mastered, this process is easy to reproduce at home. Todos Santos is an artist colony on the Tropic of Cancer, just one hour north of Cabo San Lucas, but an entire world away. Nestled next to 70 miles of pristine, undeveloped beach, Todos Santos is famous for the remarkable quality of its light, which drew the first American artists from Taos in the 1980s. Since then artists of all stripes and nationalities have populated the town, which is a charming reflection of their passions with wonderful restaurants, art galleries, and shops. The people of Todos Santos are warm and welcoming, and love sharing the pleasures of their hometown with visitors. The beaches of nearby Pescadero and Cerritos are added bonuses.This retreat SOLD OUT in March, and attendance for this session will be a maximum of 8. You’ll have plenty of free time to explore Todos Santos and its surrounding areas. Popular activities include hiking, beach walks, whale watching, gallery strolls, shopping. Optional excursions can be booked through Todos Santos Eco Adventures. Massage and yoga are offered at Los Colibris (Los Colibris’ yoga deck sits at the highest point of the property on the tropic of cancer, and has one of the most amazing views of the Pacific). Room selections will be made in order of full payments received. Contact Tami by email, or call 805.703.4291. Deposit of $850 (1/2) may be made through PayPal (2.5% more will be added to the total using PayPal) or check. Material, tool list & instructions on packing will be sent after registration. Payment in full must be completed by September 1, 2014. Cancellation and refund policy: All cancellations are subject to a 20% handling fee. For reservations canceled less than 90 days before the workshop, 50% is refundable. If canceled less than 60 days before the workshop, 25% is refundable. If canceled less than 45 days before the workshop, fee is non-refundable. Should the retreat be canceled for any reason the entire amount paid will be refunded within fourteen days after the retreat’s cancellation. Instructors have no obligation regarding any additional costs or fees related to the issuance and/or cancellation of airline tickets or other travel reservations. Instructors and Los Colibris accept no liability for any airline cancellation penalty incurred by the purchase of a non-refundable ticket or for canceled flights. Travel Insurance is recommended. All workshop participants should consider purchasing Trip Cancellation, Emergency Medical Evacuation, Baggage, Accident and Medical insurance from a reputable insurance company. More about travel insurance here. I’m a professional mosaic artist and teacher. I have been creating art all my life, and mosaic art for almost 20 years. In 2009 I started the Santa Barbara School of Mosaic Art based on my love for mosaics and a desire to share my passion with other creative people. I’ve vacationed in Todos Santos several times in the past two years and have stayed at Los Colibris each trip. I love the rustic and quaint feeling of Todos Santos, and Los Colibris is the perfect location for the accommodations and creating a wonderful environment for this mosaic retreat.